An interview with Luxdates founder Claudia Neumeister in Wort.lu . In the text, she talks about the dating scene in Luxembourg and how Luxdates has covered a need in the market. Ein Interview mit der Luxdates Gründerin Claudia Neumeister in Wort.lu . 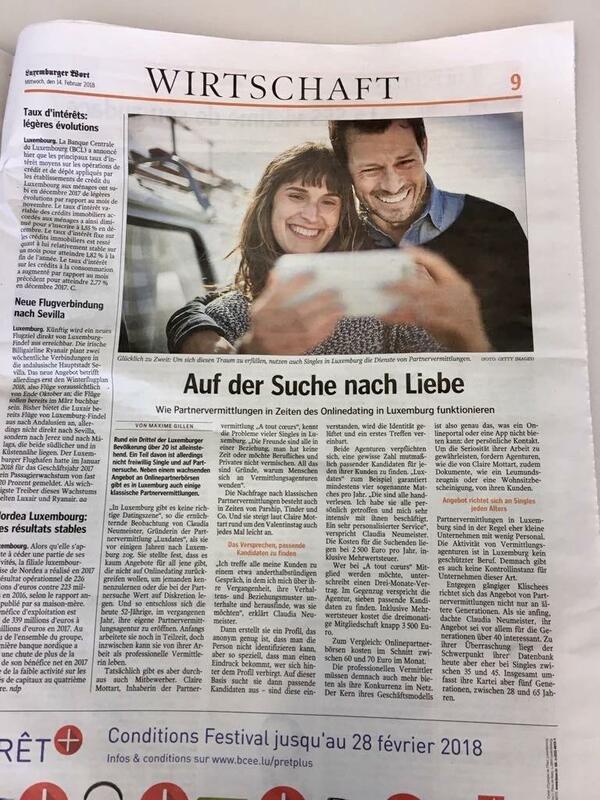 In diesem Artikel spricht Claudia über die Dating Szene in Luxemburg und wie ihre Firma Luxdates eine Lücke gefüllt hat. Merry Christmas and a Happy New Year 2019 – filled with health, success, happiness and love! Luxdates is synonymous with safety, discretion and reliability. We are helping you find a partner for a long-lasting relationship. We do all the search and selection, like a headhunter for your heart. All you need to do is fall in love.